Little wonder Thailand’s largest island has long been a holiday destination familiar to Aussies and welcomes about 12 million international tourists each year. But for the thousands of expats calling Phuket home, it’s much more than an idyllic island getaway. 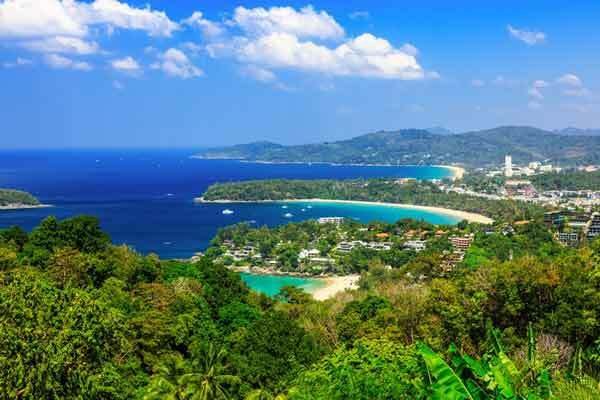 Phuket is the second smallest province in Thailand with some 543 square kilometres. However, in 2016, the National Economic and Social Development Board declared it the richest province in Thailand. Jump back to its earlier history, the island was on one of the major Spice/Colonial trading routes and enjoys a rich and colourful history. In more recent times, it derived much of its wealth from tin and rubber industries, but these days tourism is the main source of income. Phuket has been attracting expats for years. According to recent figures some 110,000 foreigners (both working and retired) live on Phuket on a full time or part time basis. With a population of about 600,000, and tourism as the main income, English is widely spoken, making it easy to settle into the lifestyle. So, what’s to do on Phuket? For starters, it’s a nature lovers paradise, with mountains stretching from north to south and nine brooks and creeks meandering through. There are some 30 beaches to explore, some take to the water—snorkelling or scuba diving the Similan and Phi Phi Islands, parasailing, kayaking, cave exploration and more. As you might expect, there is also golf, fitness centres, yoga, Muay Thai, futsal, zorbing, Thai massage to luxury spas, movie theatres and loads more. Many expats join service clubs or charitable organisations to aid the community and to ‘give back’ and contribute to society. Culturally, Phuket is a bit different to other parts of Thailand. 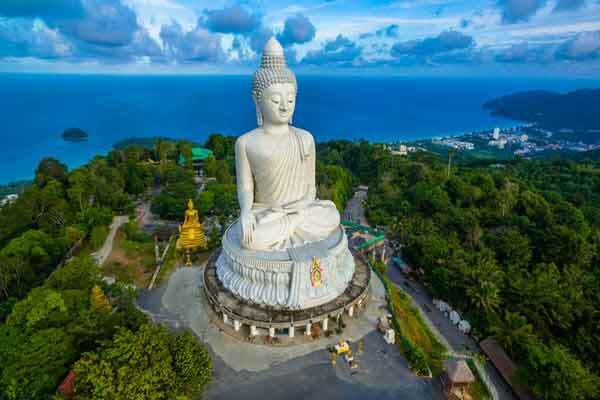 Although 95 percent of Thailand’s population are Buddhist, Phuket is a melting pot of indigenous Thais, Thai-Chinese, ethnic Malays and sea gypsies. And this diversity shines through in the cuisine. When it comes to eating, there is everything from roadside stalls, to outdoor markets, beachside restaurants and top notch five-star dining. For those who enjoy cooking up a storm in their own kitchen, there are traditional Thai wet markets with inexpensive fresh fruit, vegetables, seafood and meat or you can shop in the air-conditioned comfort at any one of the supermarkets dotted around the island. An excellent range of imported and gourmet foods are available, albeit, more expensive than local produce. For those burgeoning cooks, you can hone your skills at several cooking schools. The Blue Elephant set in a colonial style building caught my attention. When it comes to finding a spot to live, many retirees tend to shy away from the busy Patong and Karon areas. Phuket Island’s large foreign population is scattered throughout several towns and villages. The northern west coast and southern east coast areas are popular or, if you’re looking for a tree change, head up to Kathu area. Phuket is fairly hilly and many people get a car or motorbike for convenience and cost. Phuket’s international airport makes it easy to find yourself in another country within two hours or catch a direct flight to Australia if needed. As you might expect, living on Phuket is a little more than other places in Thailand, but not that much more. A couple renting a property and living moderately can spend from $3,200 to $3,800 a month and many expats report living on even less. If you like to eat out in expensive restaurants or take up costly interests and activities, it will, of course, add to your expenses. A recent cost comparison indicated Phuket’s cost of living to be about half that of living in Australia. 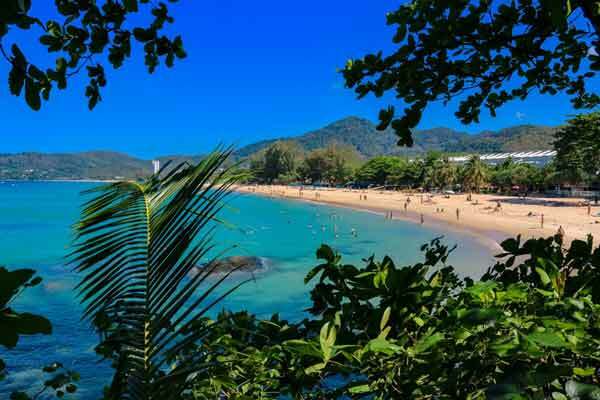 Phuket Island has a tropical monsoonal climate and it’s warm all year round. Due to its proximity to the equator, there is little variation in temperature. It has an average annual high of 33 C and an annual low of 25 C.
The dry season runs from December through March and the wet season from April until November. However, like many locations that feature a tropical monsoon climate, Phuket sees some precipitation even during its dry season. Phuket averages roughly 2,200 millimetres of rain a year. The best time of the year is November to February when the skies are clear, the breeze is fresh, the temperature slightly cooler and waters crystal clear. Like most major locations in Thailand, there are very good medical, optical and dental facilities. 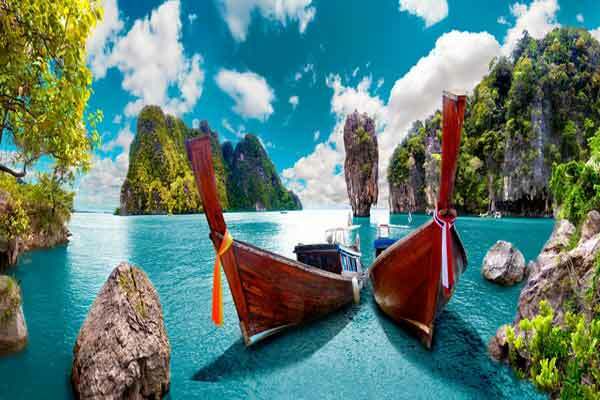 In fact, Phuket is one of the leading medical tourism destinations in Thailand. There are seven hospitals and numerous medical clinics. A visit to the doctor can cost as little as $15 and dental check and clean from about $40. One of the many benefits of moving to Phuket is that although it’s tropical and exotic, it’s also an easy life. There is a reason why expats have been moving here for decades; there’s no serious culture shock, and all the amenities you might need for modern living are at your doorstep. It is a dream lifestyle, on a beautiful island, at affordable prices. And with your own international airport, you are linked to the world. What more could you want? Best time to visit Thailand? Is Thailand a Safe Place to Live? Turquoise waters lap the white-sand beach fringed with casuarina trees. There are no jet skis or banana boats here; just a few stand-up paddle boarders and a kayak or two. There’s not a beach lounger in sight, just some mats and towels strewn in the shade. The birds are singing in the trees and I’m lazily considering getting a massage in these idyllic surroundings. It’s Tuesday afternoon and my husband and I are sitting with a beer in our hands watching a cricket match on TV. It’s hot outside, the sunshine is dazzling, but we’re being kept cool by perfectly chilled beers and whirring wall fans, so much so I’m considering ordering the toad-in-the-hole for lunch.